Merchandising units are a vital part of retail stores, which help to gain consumer attraction. Increasing product sales is a basic principle of merchandising units, although nature of these units vary from industry to industry. Retailers increasingly seek innovative merchandising units for bolstering their product sales through coordination of sales, advertising and marketing strategies. Small business owners are considered to be leaders concerning innovative merchandising unit strategies. Business owners continuously seek economical merchandising units, which utilize space, products and materials that are already available in the store. Versatility is among key considerations among manufacturers of merchandising units, who focus on developing products specific to demand. Demand for effective merchandising units, which enable minimal time lag between when potential buyers are in the proximity of the design and when they can react to it. Merchandising units have further gained high demand with their provision of good retail option for short-term for companies that don’t have their own stands. 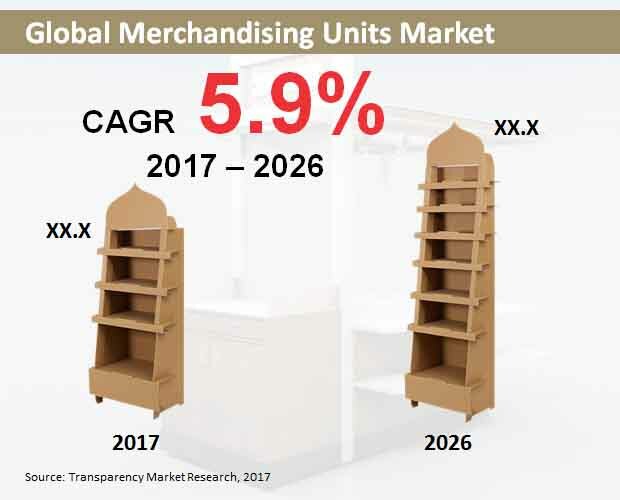 According to a new Transparency Market Research report, the global merchandising units market will reflect an above-average growth in the period of forecast, 2017 to 2026. Over US$ 600 Mn worth of merchandising units will be sold across the globe by 2026-end. Trading from retail merchandising units is deemed as a great stepping stone for testing retail environment and introducing products to new audience, devoid of the requirement for investing in bespoke kiosks. Majority of the retailers have now commenced opting for merchandising units prior to shifting their preference toward purchasing their own stands. Most of the merchandising units offer fuss-free method of displaying products, relieving retailers from building or factoring costs of installations. Provision of wheels as an additional feature further offers retailers with the flexibility of locating their pitch. On websites, product manufacturers leverage narratives for appealing certain consumers, who are most likely to purchase from their site. In a bid to gain perfection in this practice, companies focus on better understanding their audience. A similar trend is paving its way into the offline shopping landscape as well. Product manufacturers are targeting customers accomplishing specific objectives, meanwhile constructing narratives for reaching them. Over the years, big box stores depended on customer base residing in the suburbs, bought products flocked to POP units. However, the millennial generation prefers more on settling in cities, which in turn has led big box retailers is opting for warehouses with smaller retail forefront. These retailers are now focusing on installing satellite stores that can bode less inventory. This has further led manufacturers of merchandising units to stay abreast with the changing trends, which in turn might create lucrative avenues for the global merchandising units market. A new concept in merchandising is gaining notable popularity, which includes utilization of depth deception for adding perspective in store showrooms. The Association for Retail Environments states on such employment of depth deception to be an erected wall equipped with cubbyholes that comprise LCD panels for displaying digital images of products in the stand. TMR’s report has identified & tracked key players underpinning growth of the global merchandising units market. Prominent players operating in the market include Smurfit Kappa, STI Group, Boxes and Packaging, Creative Displays Now, Print & Display, Panda Inspire, and Tilsner Carton Company. Merchandising wares is no longer confined to brick-and-mortar stores. Retailers across the globe are seeking ways for leveraging the internet to attract consumer interest and provide them with valuable information on the products that they sell. For example, offering downloadable coupons and circulars on store websites are key strategies adopted by retailers for facilitating customers in planning and online prior to their purchase from the store. Offering information on websites with regard to price reductions, special displays and seasonal products is an emerging way of merchandising goods online which in turn helps in increasing the customer base. These factors will further rub off on demand for merchandising units and displays, as with more customers demand for goods and their relevant storage units will witness a surge. The global market for merchandising units has been thoroughly analyzed in one of the latest research report of Transparency Market Research, which imparts holistic insights on key factors impacting the market’s landscape. Growth prospects offered in the report are assessed for the period between 2017 and 2026, and the historical analysis on the market has been delivered for the period between 2012 and 2016. The report issues analysis on key threats, opportunities, restrains and drivers of the merchandising units market’s growth, coupled with in-depth study on their likely influences on the market. Valuable qualitative information offered in the report can enable readers in acquiring a thorough understanding of impactful market dynamics. Apart from a comprehensive analysis on influential market dynamics, the report also encompasses the raw material sourcing strategies, pricing analysis, cost structure, and supply chain analysis on the global merchandising units market. The report comprises a detailed segmentation-wise analysis on the global merchandising units market, which provides readers with better understanding about lucrative and sluggish avenues for the market expansion. The global market for merchandising units has been assessed across a range of segments namely, product type, end-user, and region. Geographically, the market has been branched into Asia-Pacific excluding Japan, Latin America, Japan, Middle East & Africa, Europe, and North America. The report also encompasses an exhaustive chapter on the merchandising units market’s competition landscape, which gives a detailed profiling of key companies that offer significant contribution to the market growth. Along with in-depth discussion and analysis on the business and product development strategies of the market players comprised, the report also sheds light on financial performance of these companies, coupled with their recent developments over the past couple of years. This concluding chapter of the report is of high value to the report readers, as they can attain actionable insights on novel developmental and growth strategies employed by the market players. This will further help them in gauging their respective positioning in this highly competitive market. A thorough primary and secondary research has been employed by TMR’s analysts to compile this analytical research study. Numerous interviews have been conducted with the industry experts and influencers, to arrive at the provided projections & conclusions, along with referring to company press releases, investor briefings, and industry databases. A robust research methodology adhered by the analysts have enabled them to arrive at the quantitative assessment that has been rendered in the report. In order to identify anomalies, a peer-review of the qualitative and quantitative analysis has been carried out. The report is displayed in an easy-to-understand and a lucid way for enabling readers gain deeper understanding on the global merchandising units market.